Treadle Yard Goods is a full service fabric store specializing in natural fiber fabrics for apparel. We carry a well-curated collection of fabrics not found elsewhere - silk, wool, linen, rayon, cotton, and bridal laces. Many are designer pieces and imported from the mills in France and Italy. 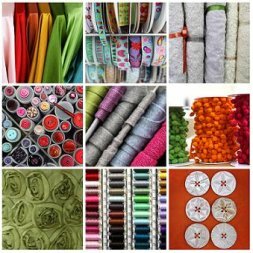 You will find an amazing array of buttons, full line of patterns, gorgeous ribbons and all the notions needed to complete your project, plus exceptional customer service! We are located on Grand Avenue, St Paul's premier shopping street. Treadle Yard Goods was founded by Mary and Paul Daley in April, 1976. Paul and Mary worked together tirelessly to create a wonderful haven for everyone who loves fabric and loves to sew. Our goal has always been simple; provide quality, natural fiber fabrics at reasonable prices, offer friendly, helpful and knowledgeable customer service and provide a locally owned, neighborhood shop where we can come to know our customers, their families and their concerns. We always strive to tailor our fabric collection to meet the needs and desires of our customers. We remain dedicated to fashion and apparel sewing, while offering support for the sewing enthusiast who prefers to make items other than clothing. We value your feedback and welcome comments and suggestions. Sadly, Paul was taken by cancer in December 2002. His can do spirit and genuine affection for Mary and the shop they created and nurtured remain with us. He is greatly missed. Long time employee, Michele Hoaglund purchased the shop in August, 2015. She is excited to build on the forty year foundation and guide Treadle in a long and prosperous future.